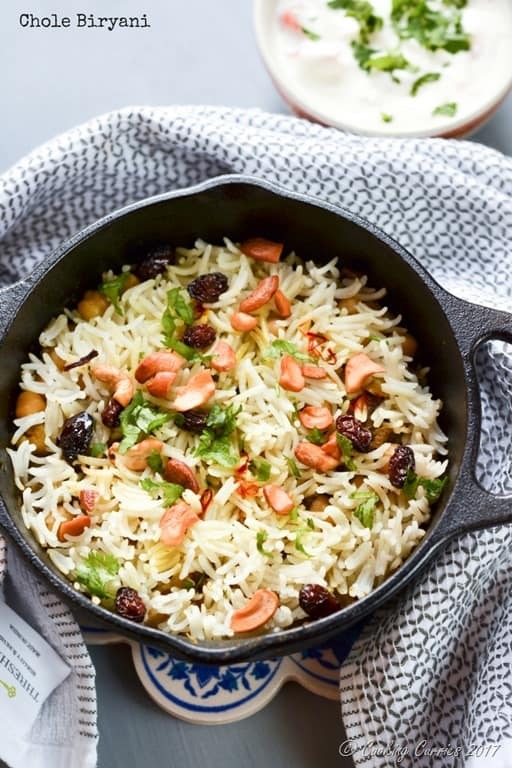 A change from the regular vegetable, chicken or egg biryani and a little quick and easy one too, that you don’t have to wait for a weekend or special occasion to make it! 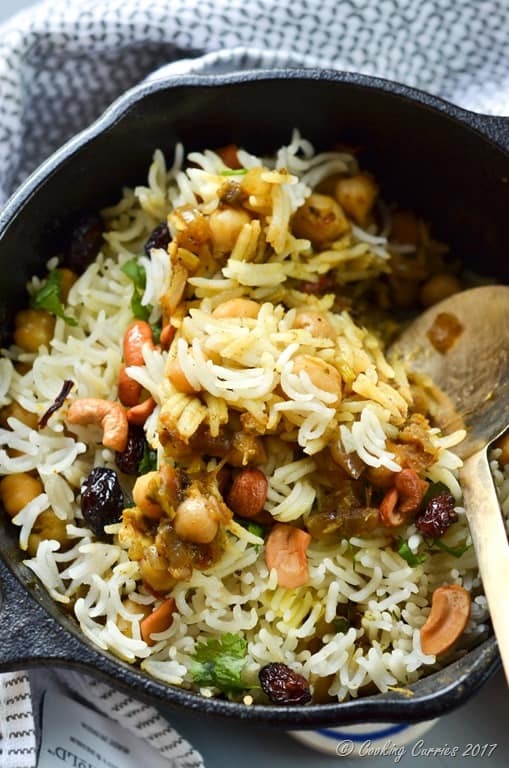 This Chole Biryani is a perfect weeknight dinner option! 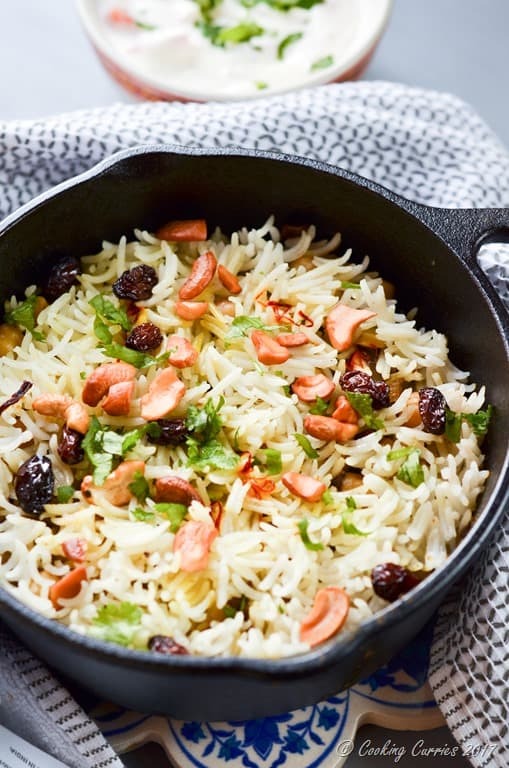 Biryanis, the king of rice dishes, can be made two ways – with the vegetable or meat sauce either mixed in with the rice or layered in between the rice. The recipes for biryani can be complex and complicated with rich flavors intermingling with each other or can be simple yet deliver a punch. These simple kinds, like this Keema Biryani, are the ones we make usually for a quick weeknight dinner or a weekday lunch, if AJ ends up working from home or something like that. 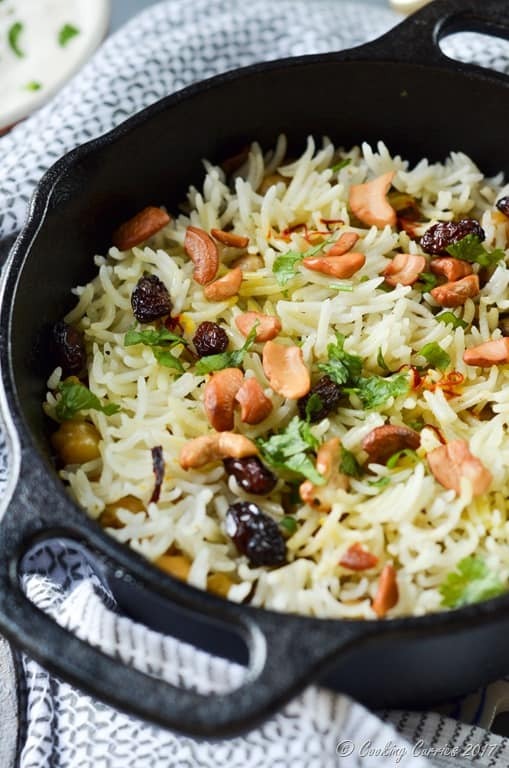 The complex ones like my famous (if I may say so myself) Chicken Biryani and Vegetable Biryani is usually reserved for weekends or for special occasions like birthdays, anniversaries or when we are entertaining guests. 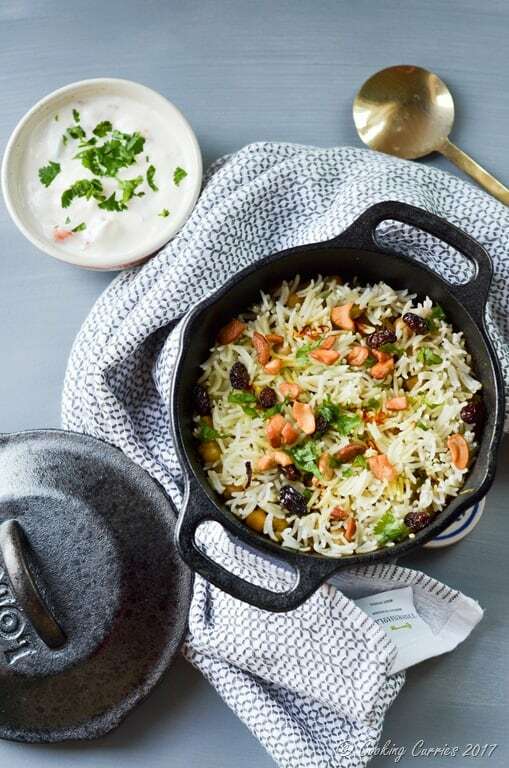 Biryani is the perfect dish to make for a crowd. It is like a casserole and all you need is some accompaniments to go with it, like – papadams, raita and pickle. And that’s all. You are all set to throw a dinner party for a crowd. 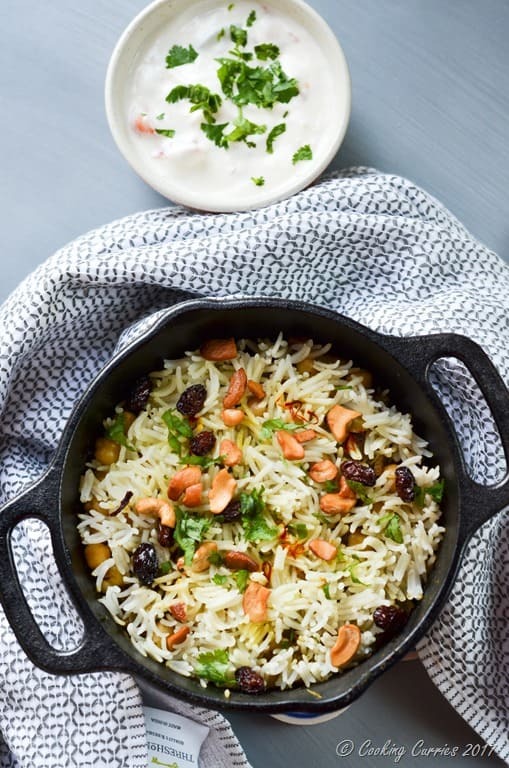 Though I love to make the complex chicken and vegetable biryanis, that I make quite often, I sometimes need a quick recipe for that sudden biryani craving that seem to creep up around in the household. The keema biryani is good for the boys, but that left me wanting a biryani for myself and that is how I made this Chole Biryani one day for lunch, just for myself. A quick onion and tomato raita and I was all set for a filling lunch and a quick siesta after that. Now, that’s the thing. A good nap is always needed as a biryani often leaves you with the feeling of a food coma! Crush the spices ( cinnamon, cardamom, cloves, pepper corns, star anise), ginger and garlic together in a mortar and pestle. Meanwhile, wash the rice and cook it with the 2 cups of water and a little salt. Once air bubbles start to appear on the surface of the rice, lower the heat to minimum and close and let it cook through. Heat the oil in a heavy bottomed pan and add the crushed spice, ginger and garlic mixture to it. Add the onions to it as well and sauté till the onions soften and start to change color. Add the turmeric powder, cayenne and garam masala and mix well. Now tear the mint and cilantro to small pieces and add to the pan. Mix it in and add the tomatoes and salt as well. Add the chickpeas and a little water, lower heat, cover and cook till the chickpeas soften. Warm the 1/4 cup milk and soak the saffron in it. Remove from heat and move the chickpeas sauce mixture to a separate bowl. You don’t have to clean the pan. Add half of the cooked rice as one layer. Pour half of the saffron-milk mixture over it. Layer the chickpeas sauce mixture over it. Layer the other half of the rice and pour the remaining saffron-milk mixture over it. Heat the ghee and roast the cashew nuts in it till golden and the raisins till they swell up. Pour this over the biryani. Put the pan over the stove over low heat, cover and cook for 5 mins or so. Switch off heat and keep it covered till you are ready to serve. Thank you Roopkala ji ? Excellent meatless recipe! And it lacks nothing in flavor. Kudos for the awesome work!